The William Optics Zenithstar 61 is a doublet apochromatic refractor telescope that excels in deep-sky DSLR astrophotography. The Z61 is the most portable telescope ever made by William Optics, a company with a reputation for building beautiful astrophotography refractors. In this review, I’ll tell you why I think the William Optics Zenithstar 61 is a top contender when it comes to affordable astrophotography telescopes. I’ll cover the features and specs of the scope, and share some examples of deep sky images taken using this refractor. Whether you use this telescope visually, or for deep sky astrophotography with a DSLR camera, you’ll be pleasantly surprised at the performance of a telescope at this size. The small size of this telescope keeps it affordable, while also providing wide-field views of the night sky. This APO is currently on loan from the manufacturer, but after a few imaging sessions – I think this may have to become a part of my permanent member of my astrophotography equipment. Aside from being a great portable option, The Z61 would make also great primary imaging refractor for anyone just starting out. The image above was produced by stacking 72 x 2 minutes exposures using a Canon Rebel T3i Camera, and the Zenithstar 61 APO. The Z61 was mounted to an iOptron SkyGuider Pro Mount, and the camera was controlled using a remote shutter release cable. 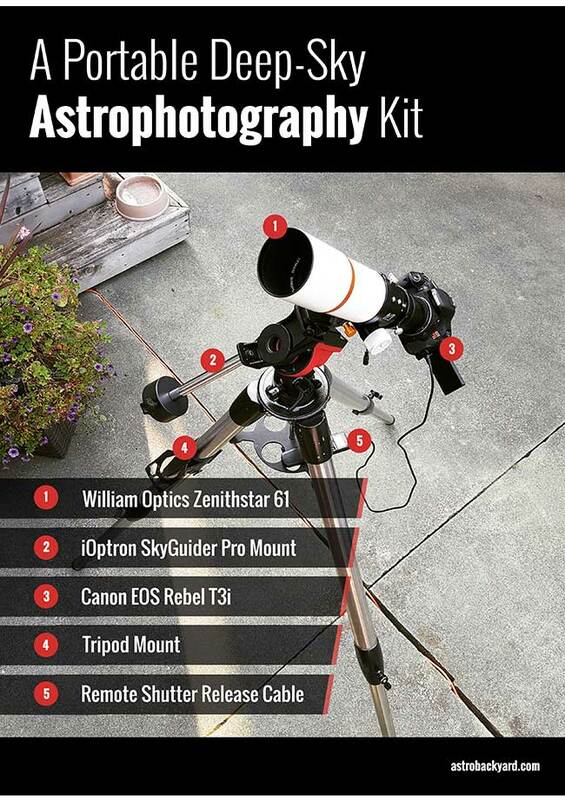 Choosing your first telescope to use for DSLR astrophotography can be a difficult process. One thing I can’t stress enough is the benefits of portability and ease of use. A larger telescope may capture more light, but it will also be harder to manage, and much more demanding on your autoguiding and Polar alignment. The William Optics Z61 APO Doublet is available at High Point Scientific. The Z61 is so compact and lightweight, I often set it up in the backyard for a spur of the moment imaging session using the iOptron SkyGuider Pro. 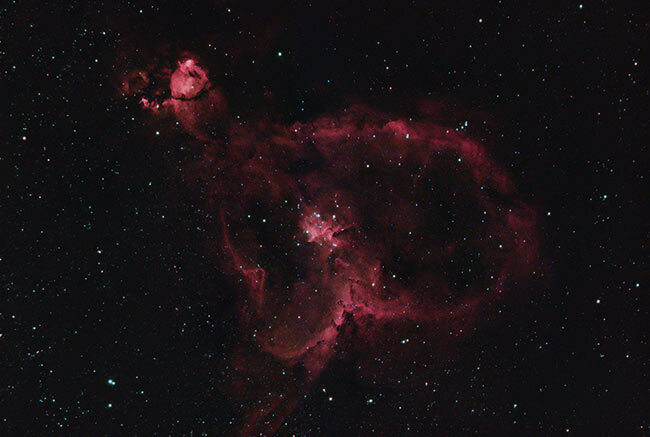 The photo above was taken from my light polluted backyard of the Heart Nebula. 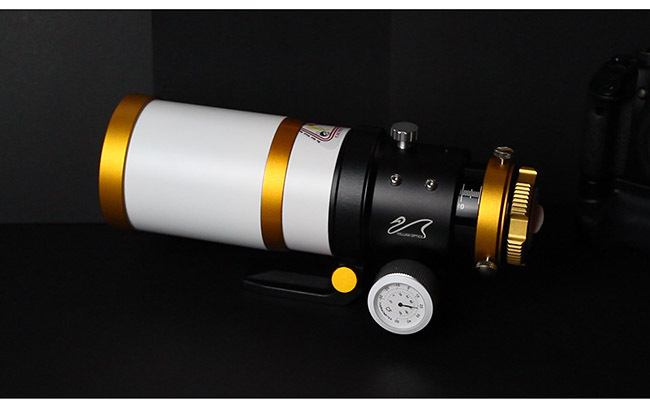 Please watch my video review of this capable little astrophotography telescope. This will give you a closer look at the features and attention to detail that make the William Optics Z61 so special. The Z61 was built to last. 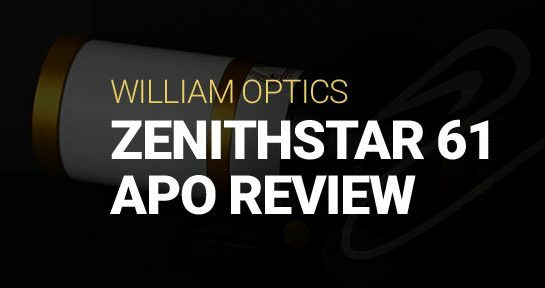 Early owners of the Zenithstar have praised William Optics for the attention to detail and finish of this scope. The Z61 includes inspection badges throughout, to remind you that this instrument has been tested before arriving in your hands. The quality of this instrument is also experienced when taking a closer look at the paint and coatings covering the OTA. The color matched dovetail plate included with my order has a beautiful gold finish. You can tell the team at William Optics takes great pride in their products. The impressive optical quality of this apochromatic telescope is due to the FPL-53 glass used. FPL-53 is as close as you can get to pure fluorite, which means that your astrophotography images will display excellent color correction, with colorful, sharp stars. This glass is used in the objective lens and is known as Synthetic Flourite. FPL-53 is the same glass used in the Meade 70mm Quadruplet Astrograph. Once you get accustomed to astrophotography images of this quality, it is hard to switch from an ED refractor to other telescope designs. Looking for more examples of imaging refractors? Please review my top 5 astrophotography telescopes for beginners. 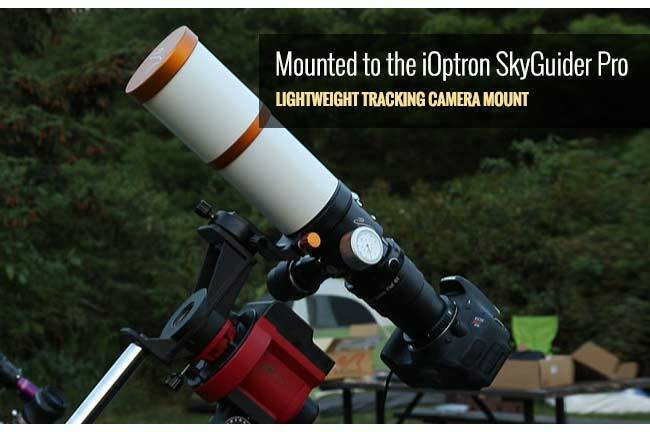 This telescope excels at wide field, deep sky astrophotography with a DSLR. The buttery smooth dual speed locking focuser means that your images will be razor sharp. 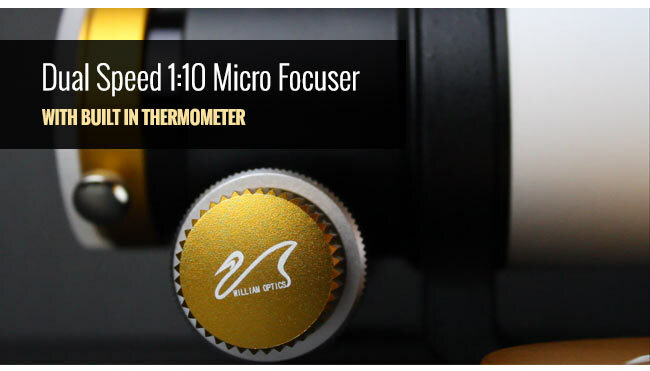 If you have ever struggled to find focus using a loose rack and pinions-style focuser, you will certainly appreciate the precision 1:10 speed micro focuser on the Z61. Whether you use a Bahtinov mask to focus using Astro Photography Tool or Backyard EOS, or simply using the 10X Live View function of your DSLR, the precision focusing of the Z61 will ensure that your image is as sharp as possible. Because the Z61 is so compact and solid, balancing the scope is extremely easy to accomplish. You won’t find a hint of wobbliness while imaging the night sky with the Z61. The DSLR and telescope are a rock solid united as one – very similar to a high-end telephoto camera lens. 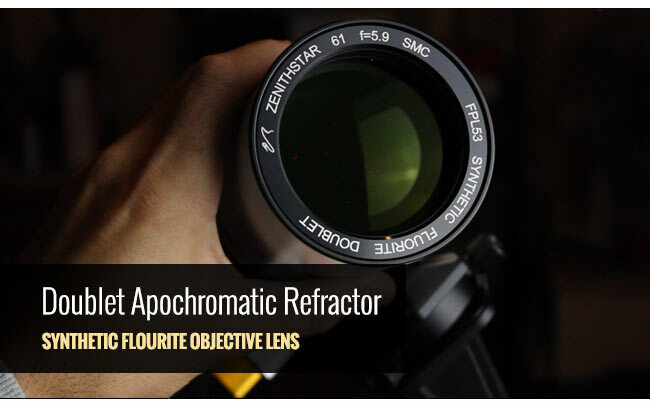 Thanks to its fast optics (F/5.9), this refractor collects a lot of light in a short period of time. Image exposures of 2-3 minutes at ISO 1600 are likely all you will need to capture deep details of your target. 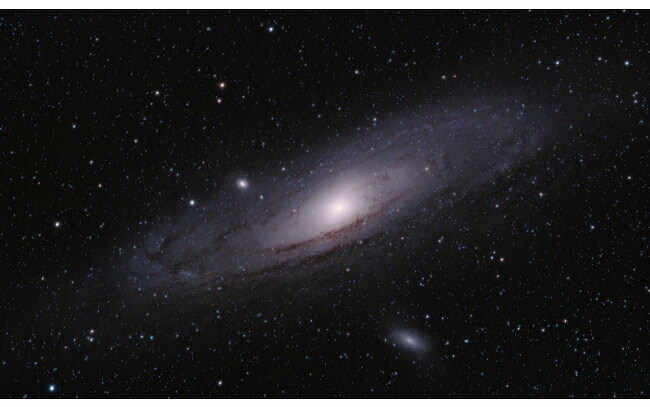 If you have ever struggled with framing up a large target such as the North America Nebula or Andromeda Galaxy, the Z61 is a breath of fresh air. The ultra-wide 360mm focal length means collecting photons on HUGE areas of the night sky in a single frame. Even with a crop sensor camera like my Canon T3i/600D, the focal length of 576mm is still more than wide enough for the big targets. A high-quality refractor at this size is the perfect travel scope. When combined with a portable camera mount, you’ve got a very capable deep-sky imaging rig that can pack up into a backpack or travel container. A collapsible carbon fiber tripod, the iOptron SkyGuider Pro, and the Z61 is probably the most portable deep sky astrophotography setup I have ever seen. I brought the Zenithstar 61 with me last month on a camping trip to a dark sky site. Needless to say, the Z61 did not disappoint, as I was able to capture a new portrait of the Andromeda galaxy using my DSLR and a simple remote shutter release cable. No autoguiding or camera control software was used to capture my image of the Andromeda Galaxy. 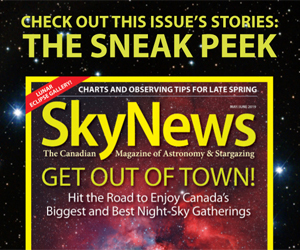 If you are new to deep sky astrophotography but have dabbled in tracked night sky shots including the Milky Way – this is likely the best possible next step for you. Never have I had such a painless first experience with a new telescope. My image final image included 72 x 2-minute exposures and was processed in Adobe Photoshop. Below is a single 2-minute exposure, straight out of the camera. The image has not been edited or cropped. These photos have not been cropped. You can clearly see the effectiveness of the Flat61 field flattener when in use with a full-frame camera. I will put this to the test myself in a future post. The William Optics Zenithstar 61 currently retails for $398 USD. The price includes the telescope only, as you can add a number of extras to your order. This includes everything from a color matched dovetail plate to the photo adapter for your DSLR camera. I didn’t require a dovetail plate right away, as I was able to mount the built-in rotatable L-bracket to my iOptron SkyGuider Pro. The photo adapter mount for my Canon DSLR was a must, so it’s worth remembering this extra cost when pricing it out. 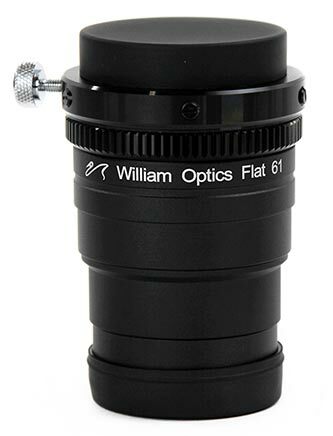 William Optics lists the Flat 61 for Z61 as a recommended accessory for this telescope, and I recommend that you get one too. The Flat61 was designed to be a perfect match for the F/5.9 focal ratio of this telescope, meaning that your images will remain crisp to the edge of the field. This is an extra expense, with the Flat61 retailing for about $170 USD. Pretty steep when compared to the price of the telescope itself. The good news is, you don’t need the Flat61 right away, as long as you are okay with cropping your images to about 85% (Crop sensor DSLR) when processing. You can connect your DSLR via the included 1.25″ Rotolock adapter (available in color-matched version), or invest in the larger 2″ Rotolock M54 pictured below. The 2″ Rotolocks pictured below matches the gold accents of my Zenithstar. This is a great option if you are looking to use the Z61 for visual observations using a diagonal and eyepiece. I really appreciate the thought that goes into the design of William Optics products. Owners pride themselves on having gear that not only works brilliantly but also looks good doing it. It’s hard to find a telescope manufacturer that pays more attention to aesthetics than William Optics. The William Optics Z61 APO Doublet refractor telescope is available at Ontario Telescope and Accessories. I was thoroughly impressed with the fit and finish of the Z61 right away. The functionality of this telescope matches its attractive exterior. The portability and precision focuser make the Zenithstar 61 a pleasure to use, both at home and while traveling. The high-end optics of this doublet become quite evident when reviewing images taken through the Z61. 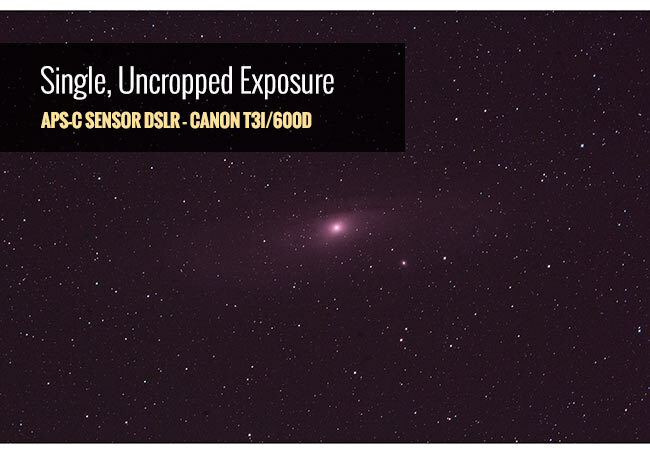 At 360mm, the focal length using a full frame or crop-sensor DSLR camera is ideal for large deep-sky objects. 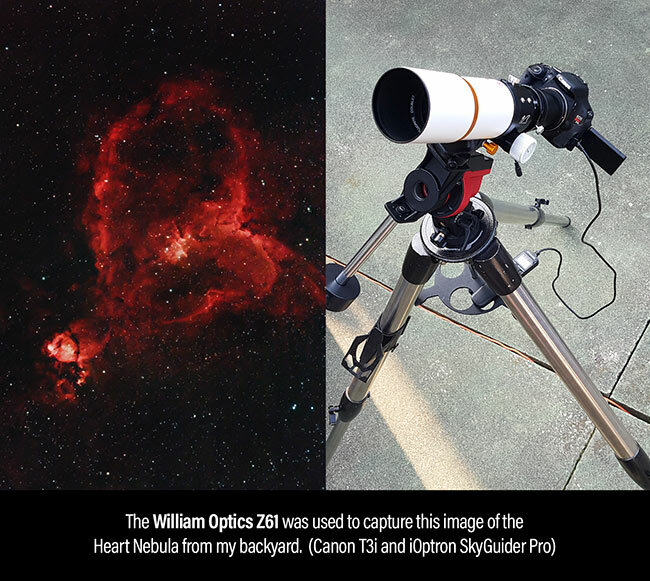 In September 2017, I photographed the Heart Nebula from my backyard using the Z61. This target is another great example of the FOV you can expect in the Zenithstar using an APS-C sensor DSLR camera. All things considered – the Zenithstar 61 APO is a steal at $398. However, factoring the cost of the additional accessories will bring you back to reality. With that being said, I dare you to find a complete telescope package that can compete with the beautiful Z61.